The Philippines capped off a highly successful pageant year by winning Miss Tourism International 2012 last night in Kuala Lumpur, Malaysia. 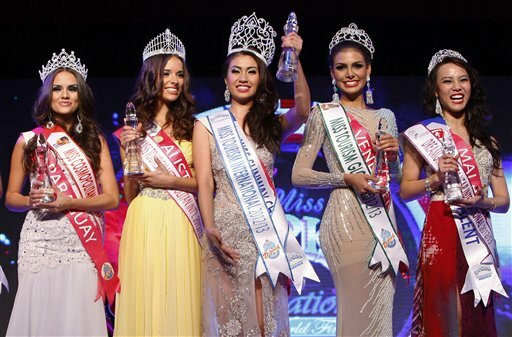 Rizzini Gomez beat 55 delegates from around the world to win her country's second Miss Tourism International title. They also won in 2000. Miss Australia was second and was names Miss Tourism Metropolitan International. Miss Venezuela was the second runner-up and was awarded the title Miss Tourism Global. Miss Paraguay was the third runner-up and won the Miss Tourism Cosmopolitan title. Miss Malaysia was the fourth runner-up and walked away with the Dearm Girl of the year International title. The delegates from China, India, New Zealand, Russia, and Thailand completed the top 10. Not bad. I totally missed her but she's better than I thought. Venezuela or Paraguay would have made better winners though.